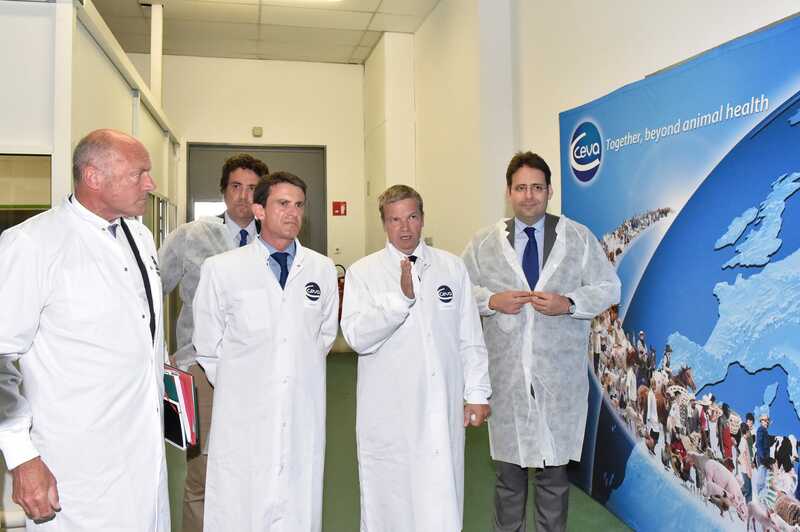 FRANCE - French Prime Minister Manuel Valls has visited Ceva’s headquarters in Libourne, to meet Dr Marc Prikazsky and other business leaders from the local Aquitaine region. The Prime Minister was accompanied by a large delegation including Alain Rousset, President of the Aquitaine region. The company has recently invested over €20 million in its Libourne site to ensure its infrastructure is of the best available global standard. For Marc Prikazsky, Ceva Santé Animale CEO, "The visit of the Prime Minister is I believe recognition for the dynamism of the French veterinary sector. Collectively we represent 20 per cent of the world market. "Ceva stands out in this sector because of its unique shareholder structure, which has helped us to deliver double digit growth for more than a decade. Hopefully, we have show that it is possible to grow and do business internationally while continuing to invest heavily in France. I believe in Europe’s industrial future because we have highly trained people and all the skills necessary to succeed, provided we continue to invest in state of the art facilities to remain globally competitive." The Prime Minister’s visit to Ceva also included a meeting with business leaders who are members of the Aquitaine Intermediate-Sized Business Club chaired by Dr Prikazsky. The Club is the only one of its kind in France and currently counts 42 business leaders from the industrial and corporate services sector based in the Aquitaine region. Together, they have combined sales of €5.5 billion and employ over 30,000 people.